In industrial packaging, we at Greif aspire to be the highest performing customer service company and to develop products that meet our customer’s unique needs. 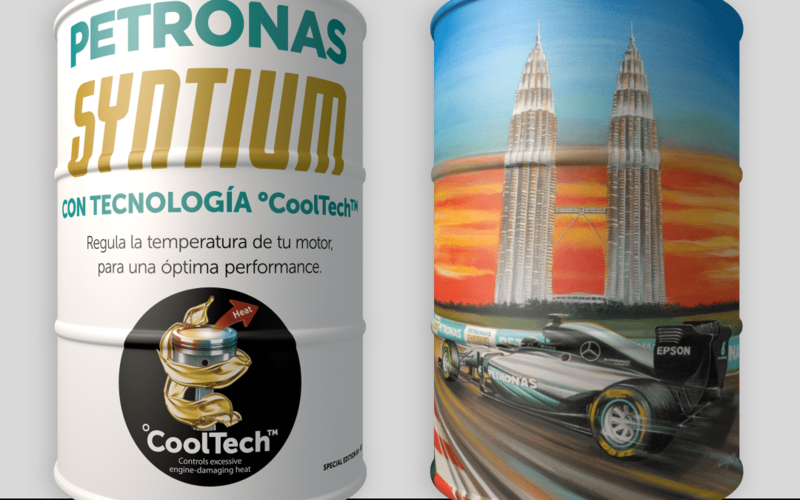 That’s why when Petronas approached Greif in August 2016 to relaunch their brand into the Argentinean market with its new premium luboil, Syntium Cooltech, Greif went above and beyond to replicate the Petronas TWIN TOWERS and Formula 1 race images on Large Steel Drums (LSDs) for the promotional launch to consumers. This innovation was led by Carlos Bonella, Account Sales Manager, and Diego Busto, Engineering Leader, both from Greif Argentina. The customer benefits included consolidated customer brand as an innovative company in the Argentina Market; called attention to Petronas premium luboil product in the distributors’ area, with the created masterpiece to decorate LSDs; and being an easy way to show the consumers the linkage between Formula 1 needs versus high technology luboil performance developed by Petronas. “Being passionate about redefining customers’ experience with our products and services is essential for establishing real partnerships that exceed their expectations,” said Gustavo Melo, Market Intelligence & ComEx Manager. Manufactured at the Greif Tigre Plant, the Petronas LSDs are taken through a rigorous manufacturing and quality process and 100% of drums are tested in order to ensure the drums meet the quality needed for the high-profile decoration. The LSDs are then sent to a third party (Materia Pixel) to plot a vinyl image of the masterpiece to be adhered to the LSDs. Finally, a Greif quality specialist conducts the proper tests on the decorated drums to approve them to be delivered to Petronas.